Read the Full Tilt Poker review. 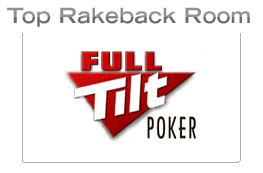 Sign up for Full Tilt Poker rakeback. Full Tilt is the top rakeback poker room with its 27% rakeback paid weekly. But what sets Full Tilt apart from the numerous other rakeback poker rooms there for you to choose from? Why is Full Tilt the top rakeback room? Some of the softest competition. Full Tilt ticks all of the most important boxes when it comes to running a great poker room. Full Tilt comfortably has more traffic and better software than any rivaling rakeback room. The high volume of traffic also means that there are plenty of poor players at the tables to keep the games nice and soft. Even without rakeback Full Tilt would still be one of the top two rooms alongside PokerStars, so the presence of the 27% rakeback deal is just an awesome bonus. Visit the Full Tilt rakeback page for instructions on signing up for the maximum 27% rakeback deal. Rakeback paid weekly (every Friday). Bonus money is deducted from rakeback payments. The Full Tilt rakeback specifications on their own are not actually all that great compared to the rakeback deals at rooms like Aced Poker (35% daily rakeback with no deductions). However, you have to remember that soft competition, traffic and good quality software will always trump the sweeteners of rakeback deal. So whilst Aced Poker has the superior rakeback deal, Full Tilt has the superior poker room, which means that Full Tilt remains as the top rakeback poker room overall. What if I already have a Full Tilt account? Unfortunately if you already have an account at Full Tilt it is not going to be possible to sign up for rakeback there. It's annoying, but trust me when I say that you are in the same boat with many other players that signed up to Full Tilt before they realized that they could get rakeback. Ultimate Bet is popular US friendly rakeback room and Cake Poker has a high 33% weekly rakeback deal. Of course, these rooms are not quite as good as Full Tilt, but they are still great rooms to play at and offer some very attractive rakeback deals of 30% and 33% respectively.